Geo-Trips :: Shetland (13) - A flying visit to Foula! 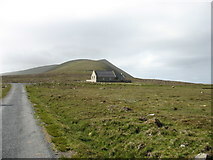 The island of Foula is a short 15-minute flight west from Tingwall (near Lerwick). I was booked this morning, but was warned that the winds were strong enough that they might not be able to bring me back in the afternoon! As I had to leave Shetland the next day, I could not take the risk. I spent much of the day in the extreme south of Mainland - see Shetland (12). 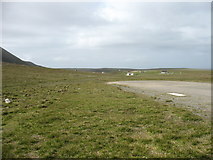 However in the afternoon the flight was going, and I was confident that the pilot would want to (and be able to) get back that day, so I went to Foula, hopped out and got a couple of photos, and flew straight back again. An expensive 45-minute joy-ride (about £80 IIRC) but a lot cheaper than returning from Bristol the following year! Two photos hardly make a Geo-trip, but in the context of the 15 linked trips in the Shetland Islands I wanted to include Foula. 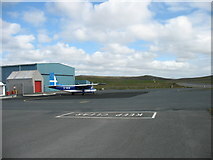 Then I found that I must include at least three photos, hence the photo at Tingwall Airport. That has the unfortunate effect that the 'marker' on the main Geo-trip map is in the Atlantic Ocean. Myriad HT was safely 'in the bag'. That leaves just HX, MC and NE. HX (Sule Skerry) is just about possible, but MC (Rockall) and NE (a large oil platform in the North Sea) I think we deem wholly impracticable.